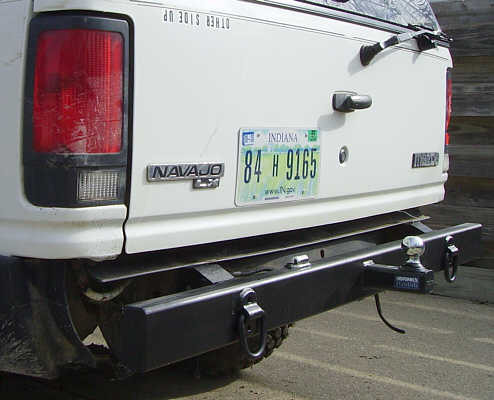 After our trip to Attica Badlands on 18th March 2006, we decided the rear bumper and trailer hitch receiver had to go. What was happening was that they are too low and project too far from the rear of the vehicle so that they crashed into practically every obstacle we crossed. On 23rd March 2006, it was time for the rear bumper and trailer hitch receiver to come off and new ones fitted. Unfortunately, some of the other bolts and the ones holding the rear bumper on weren't quite so accessible as the ones in the above image and Andy had to use his plasma cutter to cut the rear bumper off. 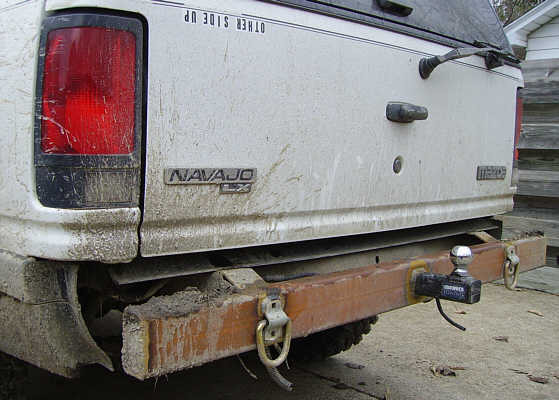 The new trailer hitch ($20, Walmart - class III, up to 5,000lbs. Gross Trailer Weight and 500lbs. tongue weight) was cut to length and a hole cut in the 5' x 4" x 2" x 3/16th" steel rectangular tube that I'd bought ($76 for two, Kelly's Metal's) as a bumper to receive it. 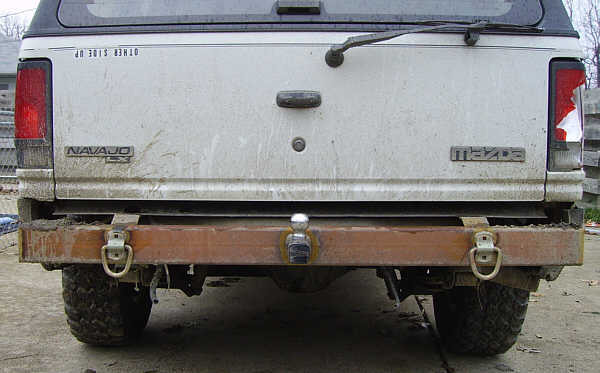 The hitch was welded into the rectangular tube and the whole thing was welded to the end of "The Ho's" frame. 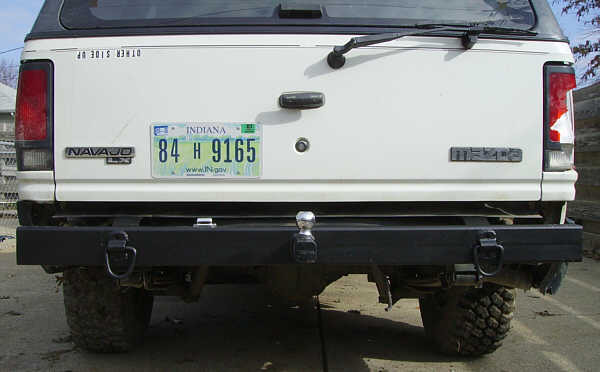 As with the front bumper, two D-rings and end caps were then welded to the new bumper. 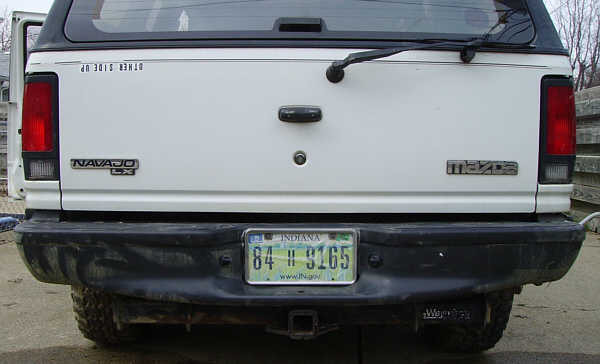 The plan for the license plate, which is currently temporarily taped to the inside of the rear window, is that it will be screwed to the rear door and a light attached to the bumper to illuminate it which should make us legal again. The illuminator cost $3 from Rural King. Holes were drilled through the back door and bumper for the self-tapping screws. The holes and screws were coated with silicone sealant to help prevent water rusting the door and bumper from the inside out. 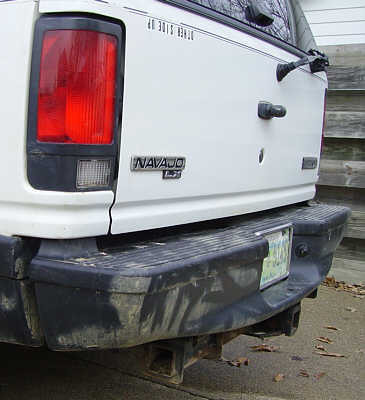 The bumper was painted with a can of Dupli-Color's Truck Bed Coating ($6, Advance).